Big Bunny Seat is a wildlife habitat installation. Big Bunny Seat is a wildlife habitat installation that is an art installation. Big Bunny Seat is a wildlife habitat installation that is a seat, a resting place. 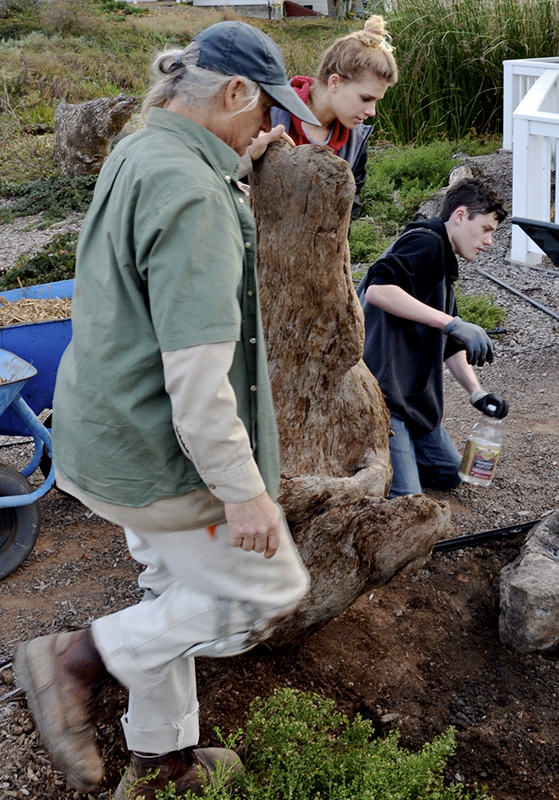 Big Bunny Seat wildlife habitat installation is an outdoor classroom project. 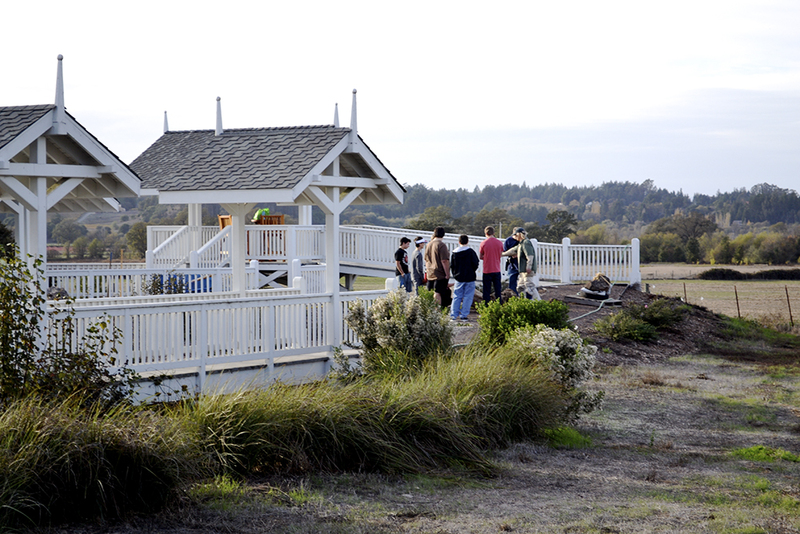 School: Orchard View School, located in Sebastopol, California. Big Bunny Seat wildlife habitat installation, AKA “Big Bunny Seat”, AKA “BBS”, was fun! 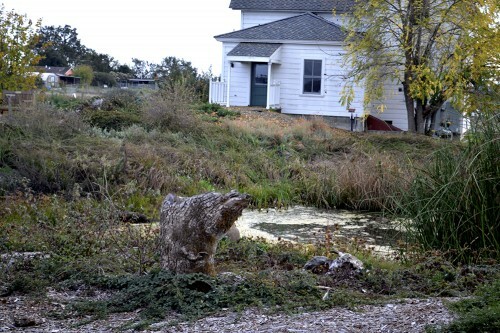 The Laguna de Santa Rosa Foundation, located in Santa Rosa, California, operates the Laguna Environmental Center, on Stone Farm, Stanford Road. 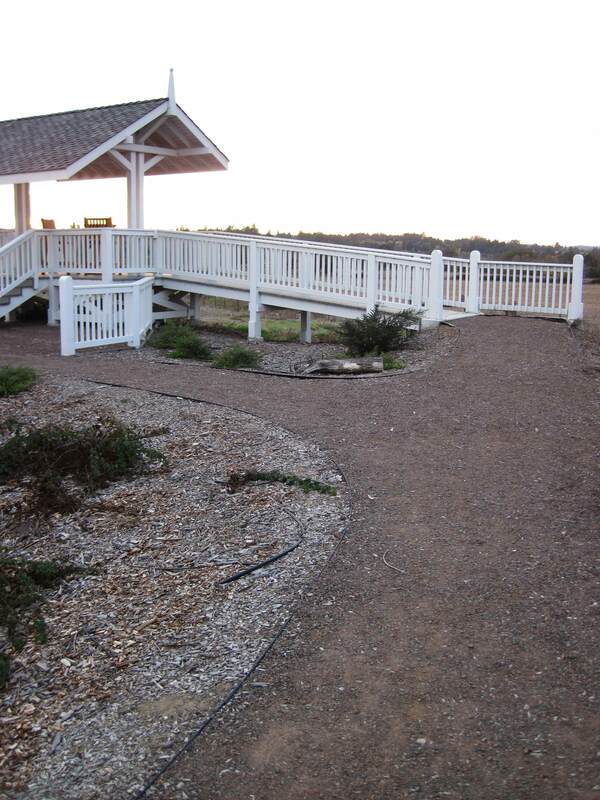 The LEC’s (Laguna Environmental Center’s) path to its Observation Platform and adjacent viewing bench terrace wanted something artistic. BBS (Big Bunny Seat) will be created here in two weeks (from photo date). 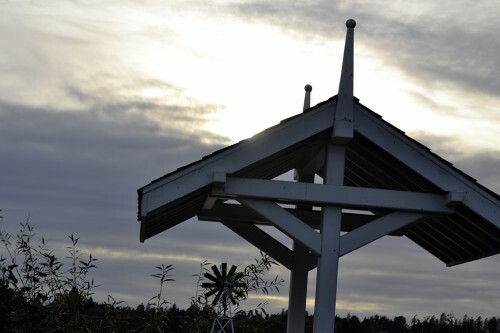 It will be a seat alongside the path, so that someone just leaving the bridge over the LEC’s Pond will have a place to rest. This habitat installation (because all this effort is about habitat installation foremost!) will be a solid, secure, trustworthy seat for the weary traveler. In other words, while considering the safety and comfort of the sitter, we will be considering this art installation’s ability to nourish wildlife habitat. Alas, a lone log lays. This log will be removed to create BBS and will ultimately be dug into the woodchips under the Observation Platform’s ramp. Note! : A student from Orchard View’s Biology class (Teacher: Sunny Galbraith; school located in Sebastopol, California) found 2 praying mantis cocoons on the log’s underside. We also saw an empty paper wasp nest. When relocated under the ramp, care was taken to protect the cocoons. Note also, in the pic above, the irrigation tube (exposed), and the easy, smooth slope of land, particularly in the middle of the young shrubs. 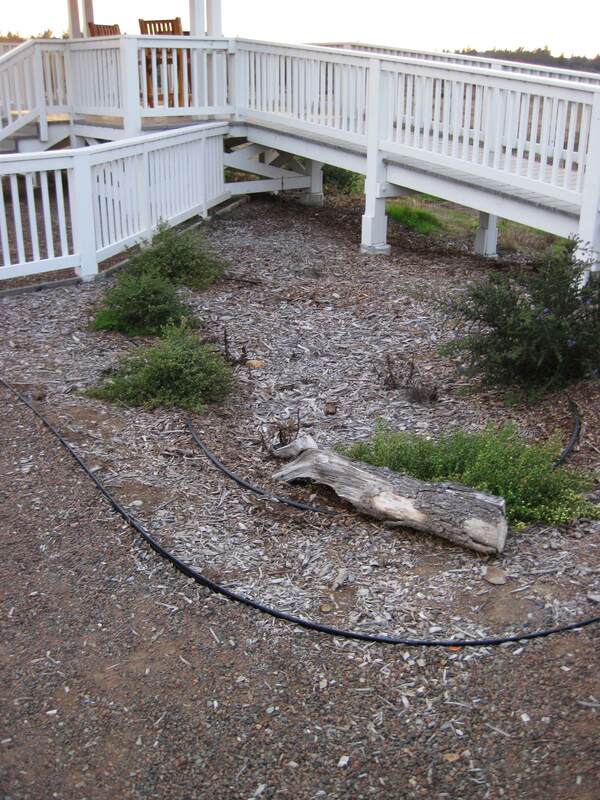 The shallow bowl of woodchips and the exposed black tubing will change during this project. Big Bunny is a hulk of redwood, perhaps a chip off a great redwood tree’s top crown to early trunk. In other words, the bulky “head” wood grain is swirly like root wood, while the other end is more linear, like a tail. Habitat feature: Redwood loves water. 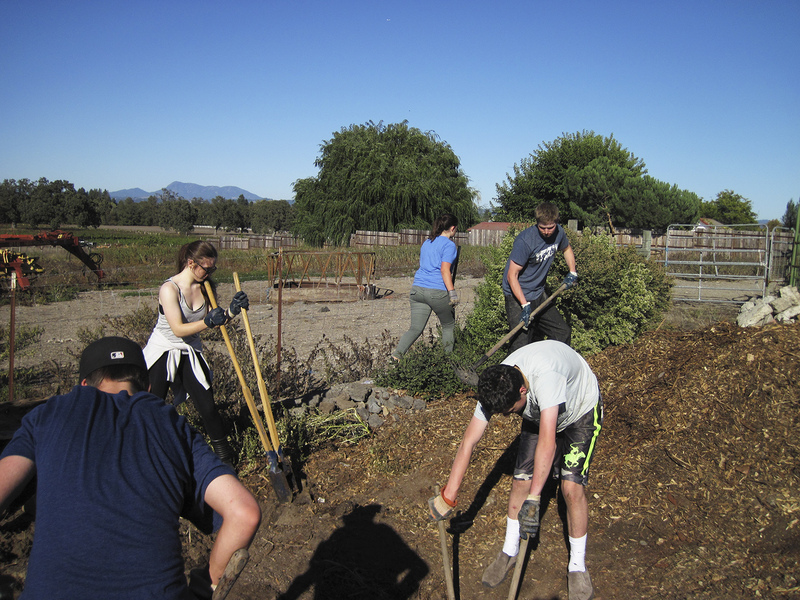 The soft, moisture-laden wood will work in tandem with the adobe soil to create a moist soft interface, mud. That’s a great amphibian, soil microbe, crustacean, gastropod place to be. Biodiversity is likely to thrive in this proposed wildlife habitat. 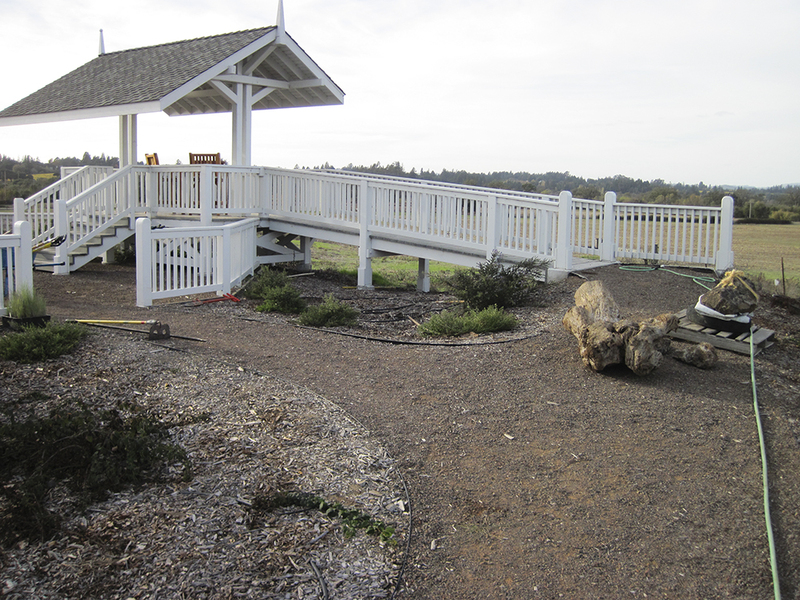 Note: The Sonoma fieldstone (local rock) on the skid in background waiting for the installation to start. Thanks for the delivery Stuart! 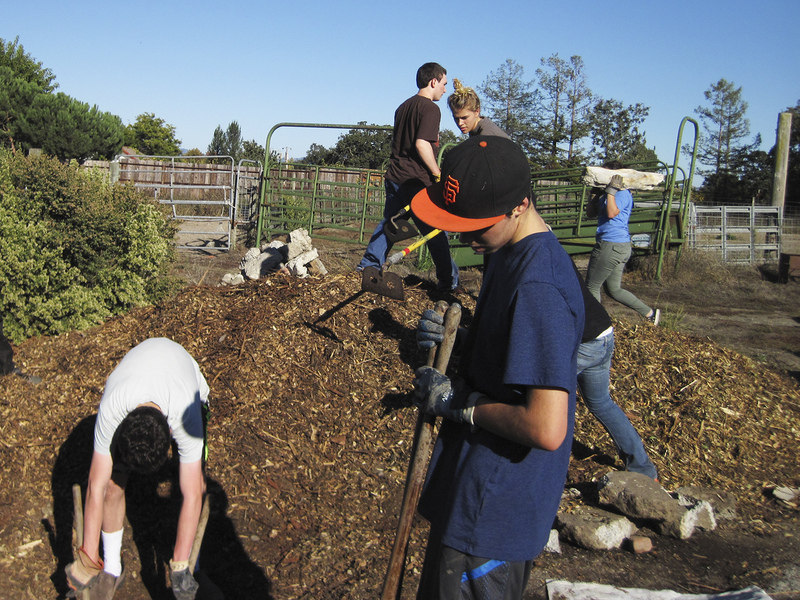 Fungi hunting grounds at the LEC – Heron Hall’s back slope mulching woodchips. 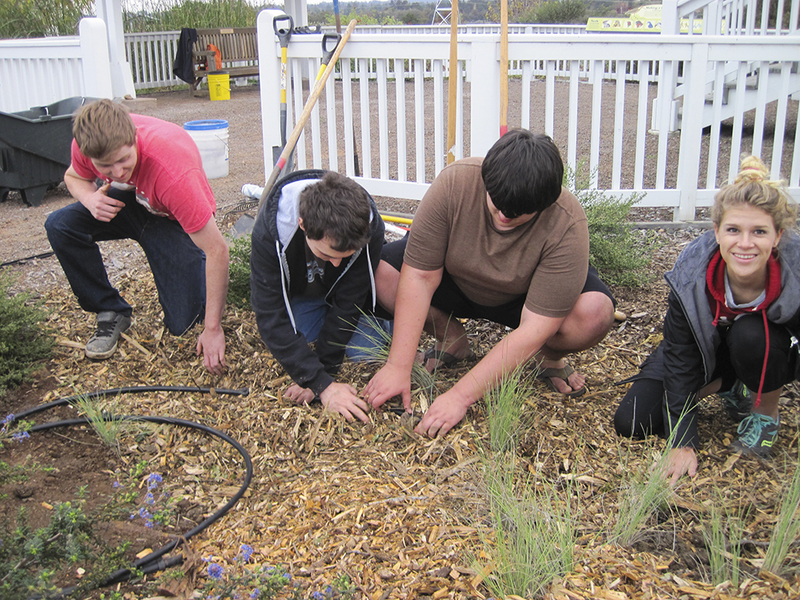 The woodchips are a habitat restoration resource. Heron Hall was recently built. The woodchips will allow the native plants and seeds, provided by the Laguna Foundation, time enough to establish, to thrive, before weeds take over. Race between Weeds and Native Plants aside, we get to harvest mushrooms. Those mushrooms will be used to inoculate the new habitat’s (Big Bunny Seat’s) new woodchip mulching. Note: White polka dot irrigation flags (pretty fancy stuff!) mark mushroom colonies. Beginning of class. Today we will be making an art installation as well as a functional bench. And, it will be a wildlife habitat. 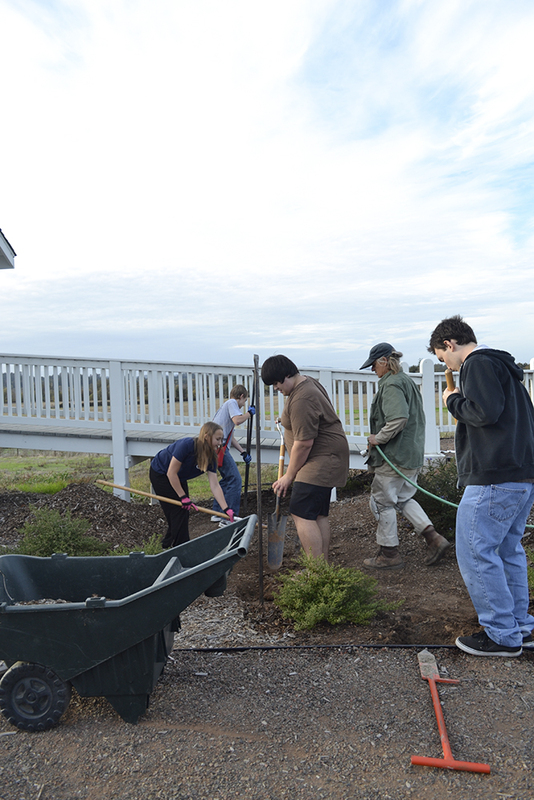 The 10-foot trench for the redwood branches starts at 6” (six inches) deep and gradually surfaces. The longest branch will rise out of the trench and become a small snag below the Observation Platform ramp. Small snag to you, nice perch for a field mouse or Pacific tree frog. Water to the rescue! A quick hosing and the trench’s adobe clay will become easier to dig. 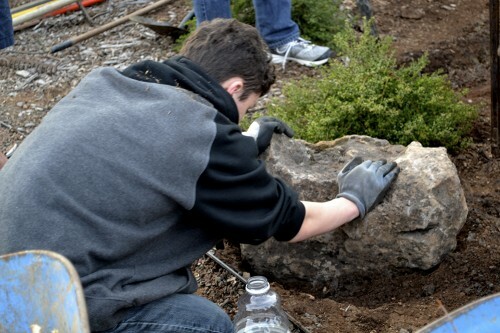 Student digs hole for the “praying mantis head” alongside the packed granite path. 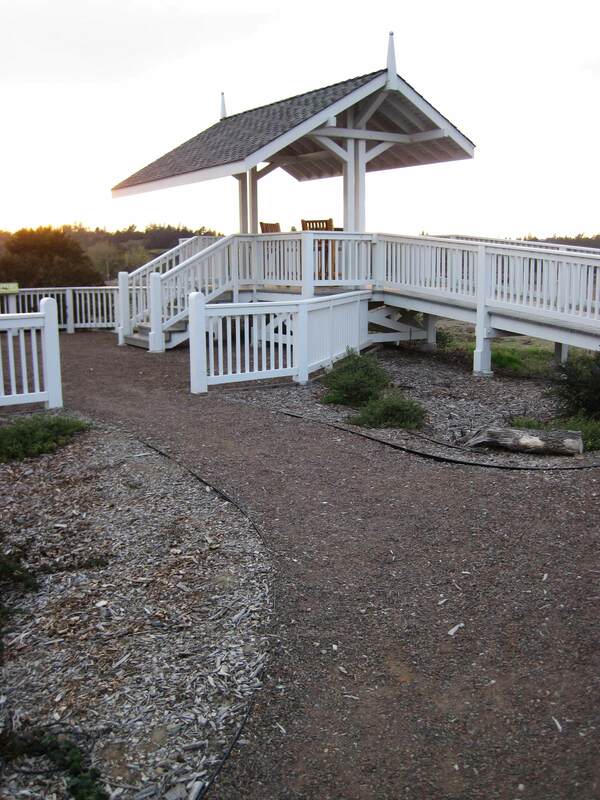 The Sonoma fieldstone rock is roundish up top and angular on bottom. It will sit firmly in the small hole dug for it. 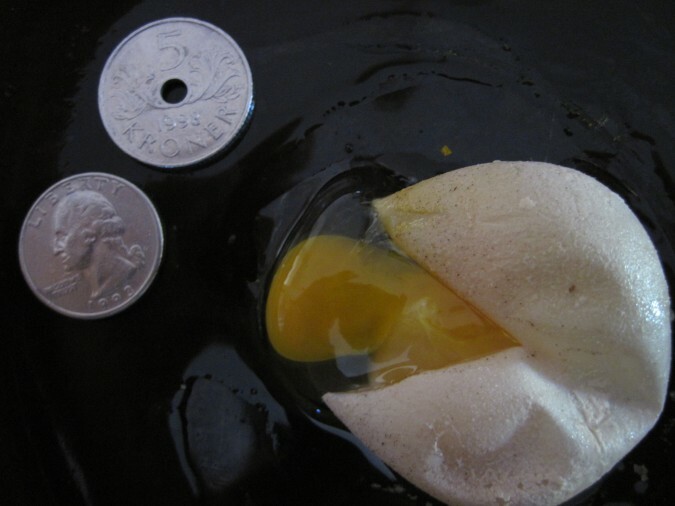 Besides providing a pool of moisture, the rock will prevent Big Bunny from tipping when the next traveler sits. 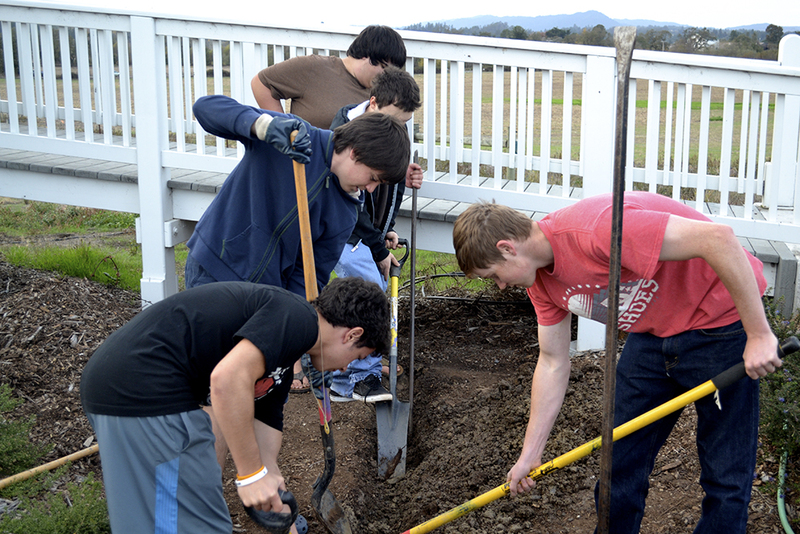 Spades and trench shovels and digging bars, oh my! 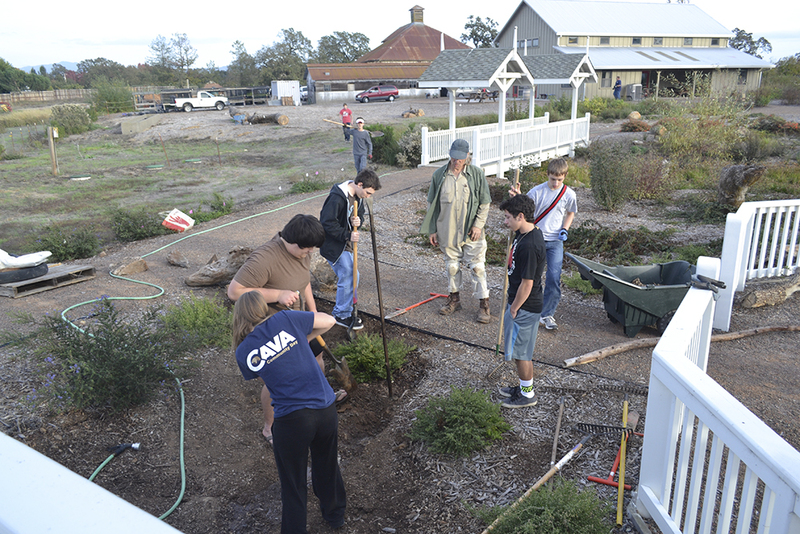 Students eke a trench out of the stubborn adobe soil. 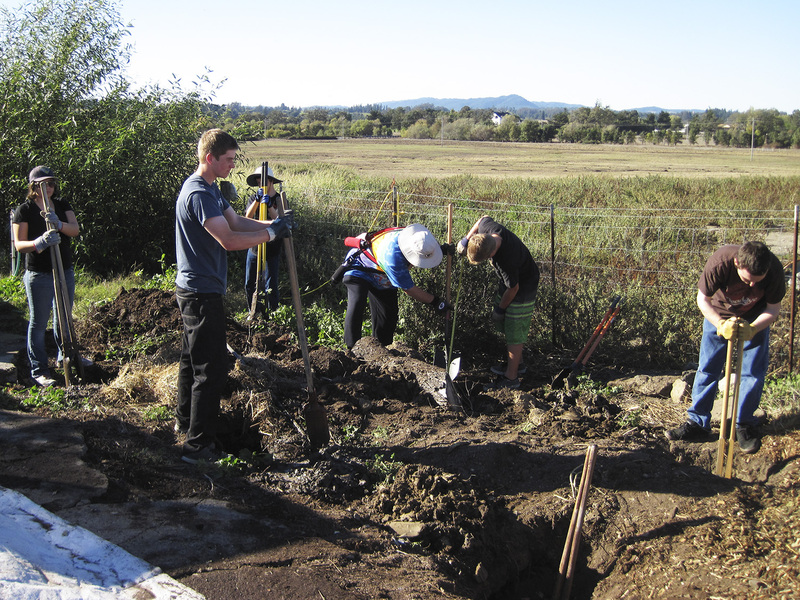 Student levels the Sonoma fieldstone. The rock has a dip on one side, which is facing skyward in the pic. Water is used to determine “level”, or better, that position of the rock that holds the most water. The goal is to create a mountain lake for tiny critters, like amphibians, reptiles, and crawly creatures smaller. A student and I have the redwood hulk balanced on its head, resting before the final flop. Lowering the redwood seat into position. 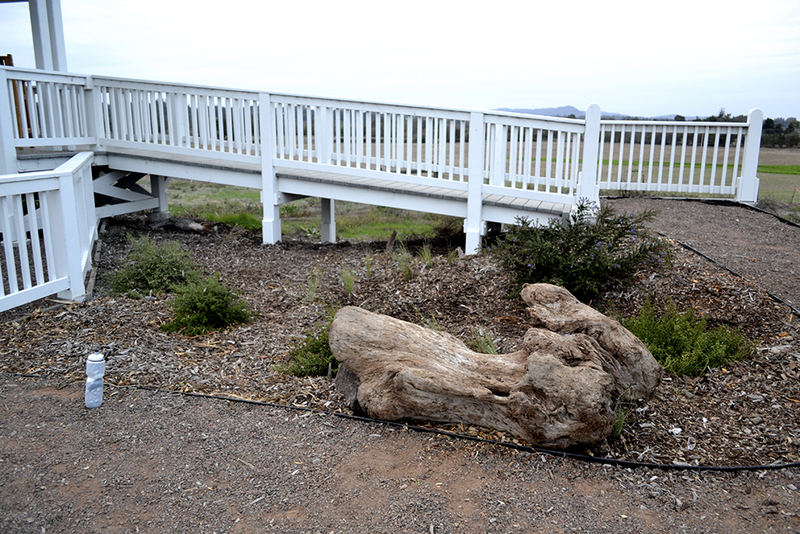 The Bunny’s tail will rest on the water-holding fieldstone, ensuring a stable seat. Sonoma fieldstone offers a shallow hillside lake to the critters inhabiting Big Bunny Seat. Newly planted grass will add to the installation’s richness. Covering the spore-covered redwood branches with straw. 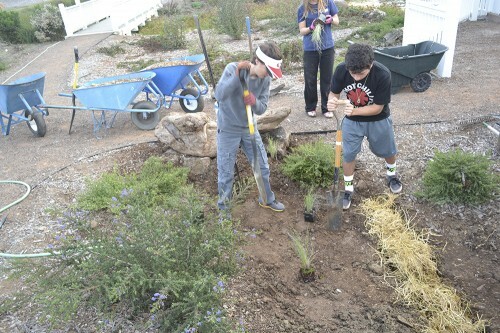 Students plant native grass plugs. Note: The facing side of Big Bunny has been covered with woodchip mushroom harvest. Those old chips will inoculate the new wheelbarrows of chips in queue. This student knows plants, and this one is the native California fescue, Festuca californica. This biology class is outdoors. Exposure to soil, Nature, time off campus are among the curricula. 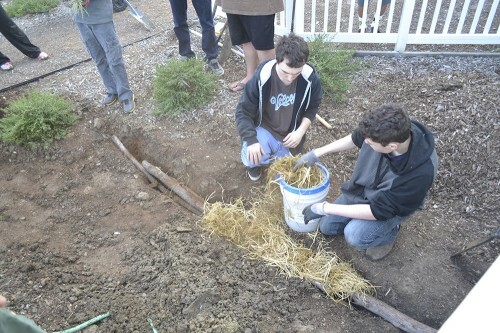 Note: Adobe soil from the trench is used to create a new grass hill. Mix things up a bit, change the terrain. The trench, topped with a layer of moisture-loving straw, is ready to be covered with new woodchips. 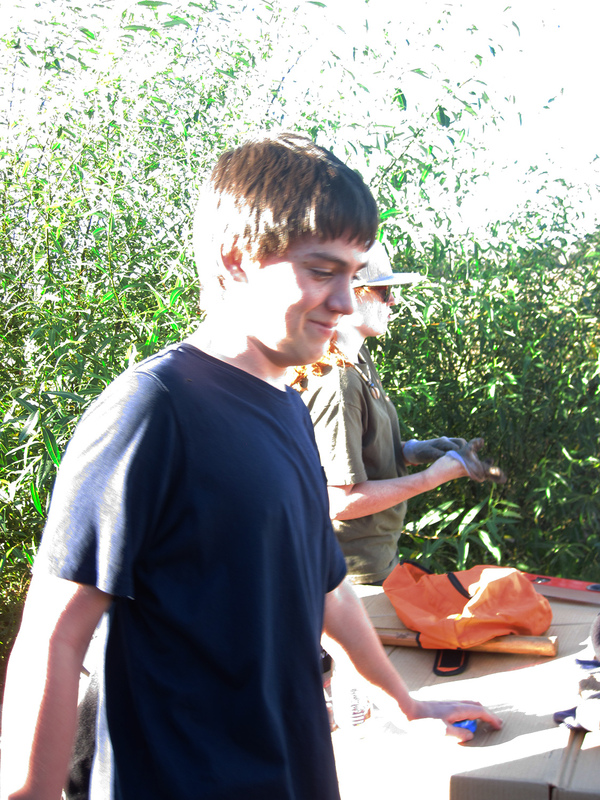 Student unwinds the flexible black irrigation tubing (plastic python). –a hulk of redwood that wants water. Any time soon the irrigation can be removed; BBS is a drought tolerant wildlife habitat. In the meantime before the piping is removed, the new grass plugs will be in Water Joy. The day Big Bunny Seat was installed. View sitting on the redwood seat, or standing very close to it. Mid November afternoon in Northern California. The LEC’s Pond and native plantings and habitat landscaping look beautiful, thriving. The day Big Bunny Seat was installed. Late afternoon November skies. This outdoor classroom rocks! Big Bunny Seat’s first day. Who will sit on you tomorrow, Big Bunny? Thank you for the wonderful pictures, Jenna. To all the Orchard View students, and teacher (Sunny), and Cordy and David, and the Laguna Foundation’s staff (especially Brent Reed, Restoration Projects Supervisor), cool project! 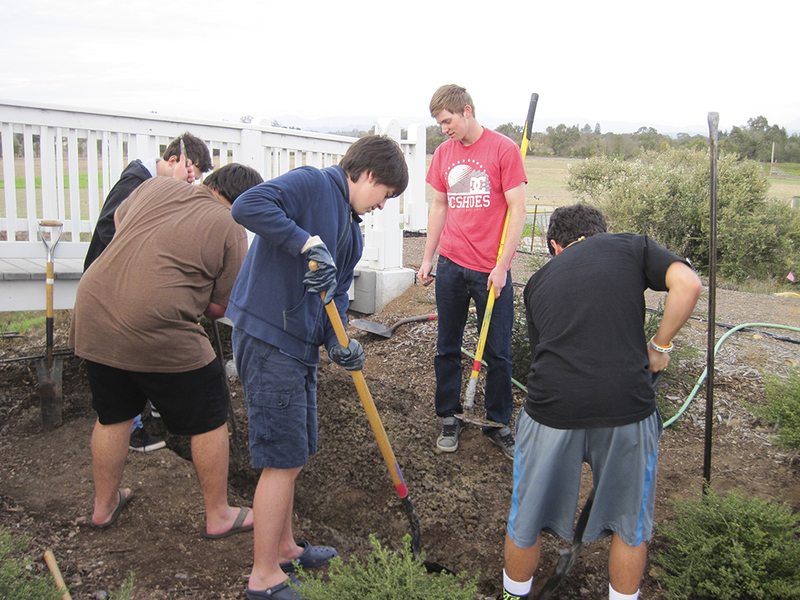 Compost Cricket Corral — completing the wildlife installation. 1- Residential Habitats -- Critters and Their Homes, Blog Comments Off on Compost Cricket Corral — completing the wildlife installation. Compost Cricket Corral is a wildlife habitat installation at The Laguna de Santa Rosa Foundation‘s complex, Laguna Environmental Center, in Santa Rosa, California, 95401. 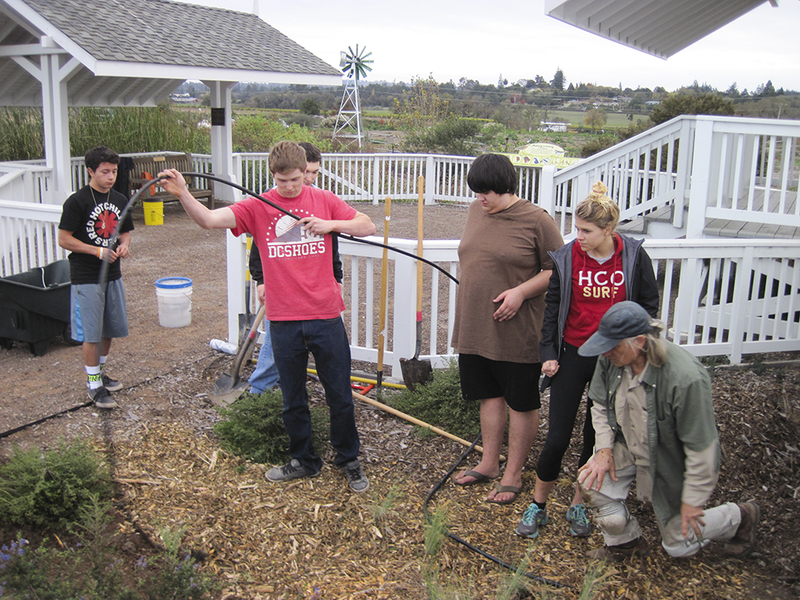 Compost Cricket Corral, installed on October 8, 2014 (2 days ago at this writing), is also about both creating an efficient compost system for the Laguna Environment and also having students experience working with Nature, in Nature. 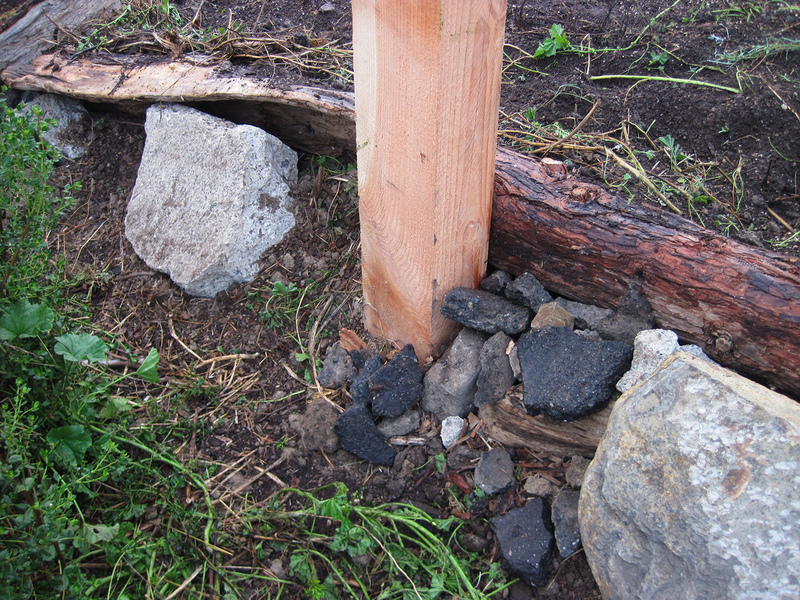 Stakes mark the pole locations for Compost Cricket Corral. Nice view of Stone Farm’s northern pasture, Irwin creek, and Mount St. Helena while we work! The above pic is where Spore Lore left off detailing the progress of Compost Cricket Corral, on 9-4-2014: “Compost Cricket Corral“. 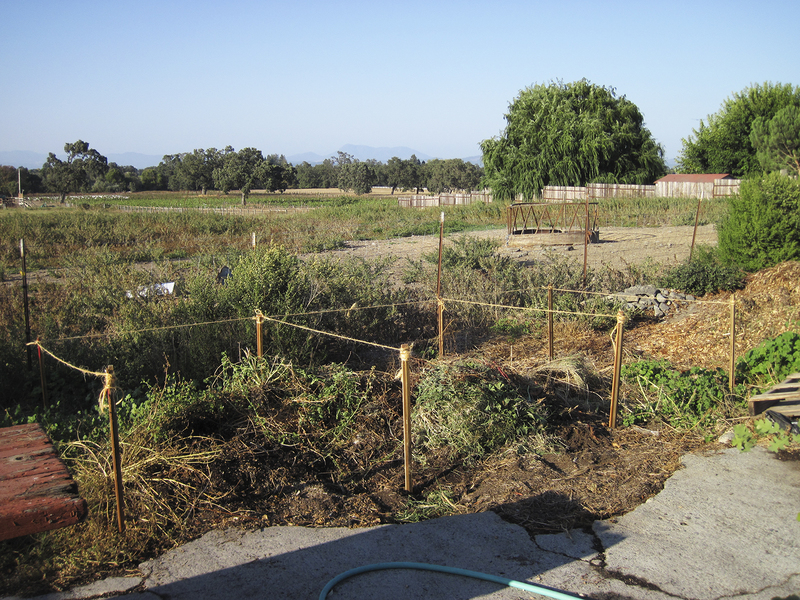 Compost Cricket Corral – The Before. This is installation day, leaving off from September’s prep of the site. 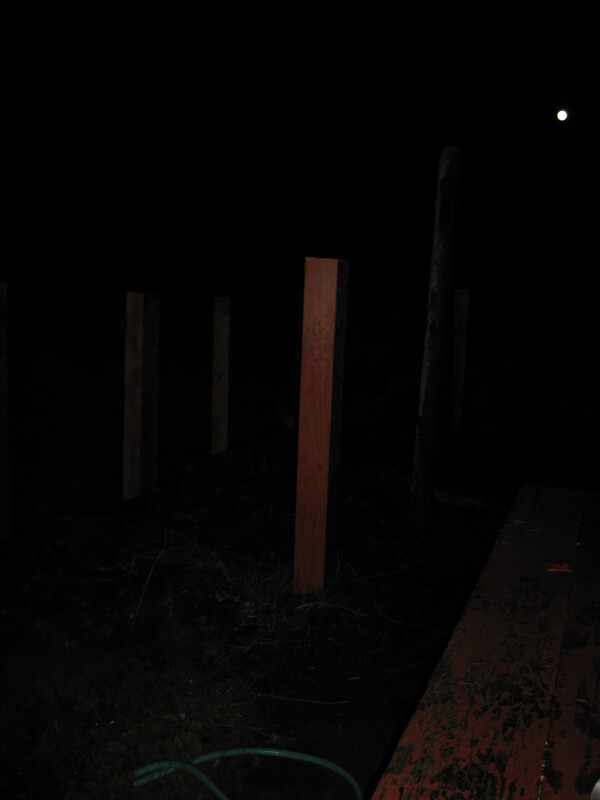 The stakes, as discussed in last month’s article, show the location of the 8 posts to be installed. Six postholes have been partially dug. 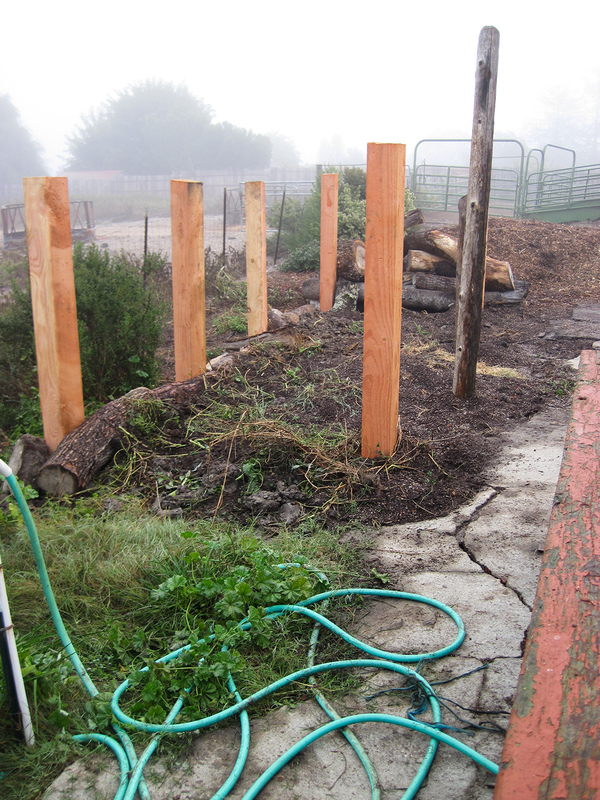 The 8 posts will create 3 compost bin areas, each roughly 6 feet X 6 feet. The students are here! Biology students from Orchard View School, in Sebastopol, will be installing Compost Cricket Corral. Lots of posthole digging! Old wood to be gathered and a wood chip pile to be shifted over a few feet. Digging, digging, digging. Outdoor classrooms include fresh air, sometimes exercise like this one, and kinesthetic learning, or otherwise known as, tactile learning. Doing is learning! Note the large wood chip pile (right foreground). 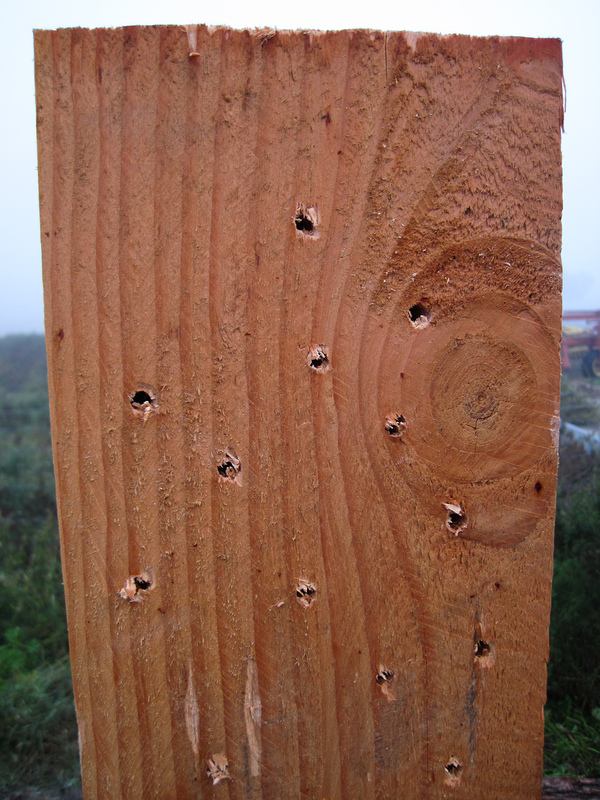 5/16” holes are drilled 3″ deep into the top of the posts to encourage insects to habitat in them. Measuring holes to get 3 plus feet deep. The deep holes will better support the posts without having to pour new/fresh concrete at their bases. 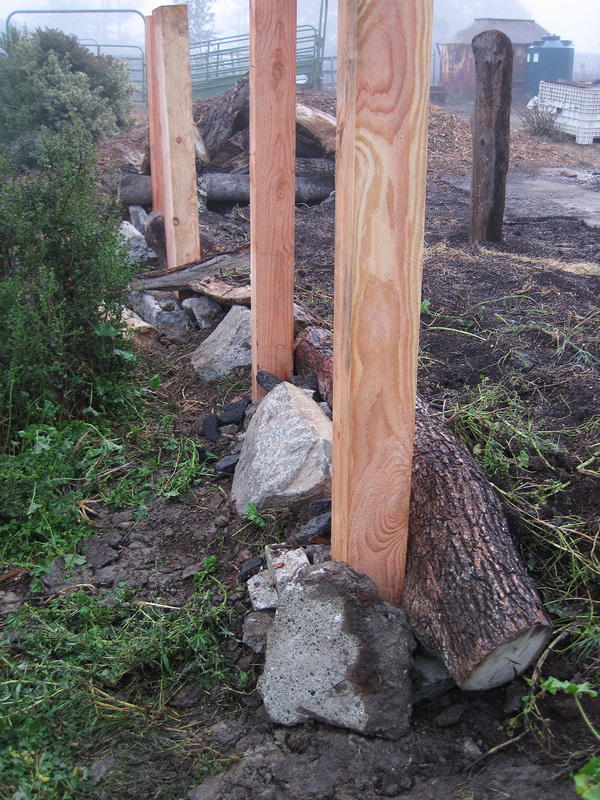 Also, the overkill deep, untreated fir wood posts will hold life-sustaining water for the habitat’s soil microbes, larger critters, and fungi/plant growth. A post is placed in its hole, then leveled vertically. 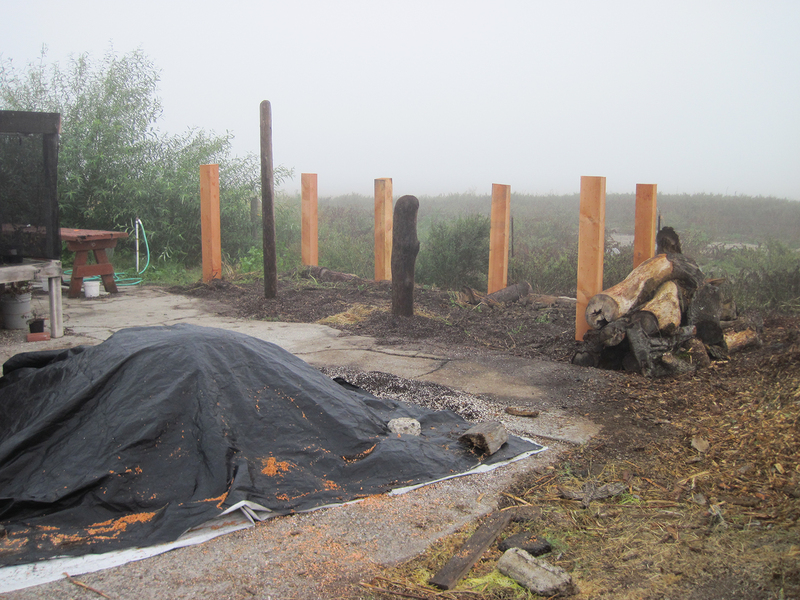 Concrete chucks are used to hold the posts in place and to create shelter cavities for wildlife. Habitat installation at the Laguna Foundation might be hard work but it sure beats being in the classroom. Outdoor classrooms rock! 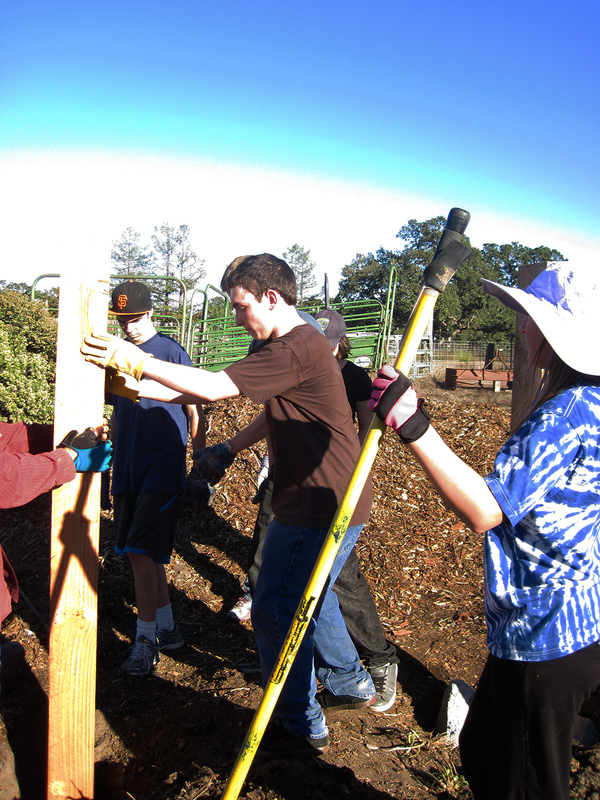 The Biology students from Orchard View School (Sebastopol, California; teacher: Sunny Galbraith) have installed Compost Cricket Corral’s 8 vertical posts AND have fled. What great work they did! Local materials, especially those that others consider “junk”, will become this wildlife habitat’s treasures. 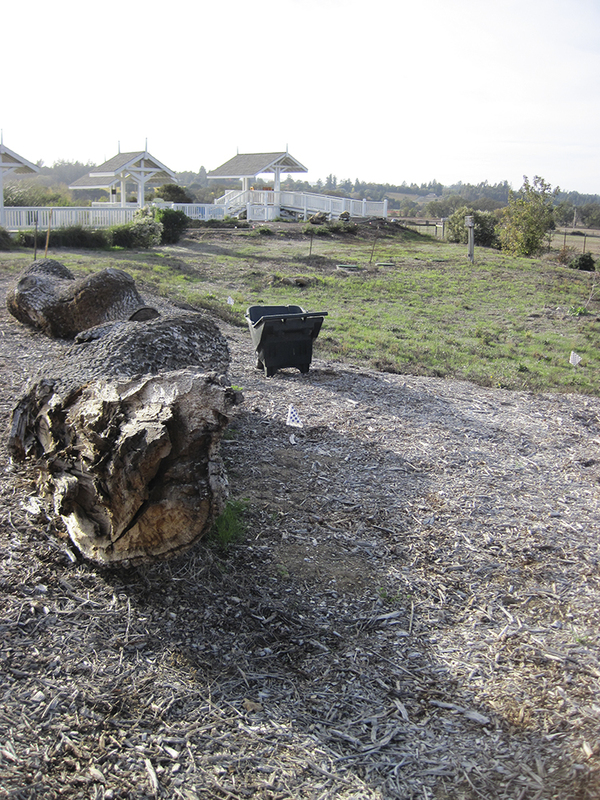 The compost bins now have defined areas – making compost will now be more efficient for the Laguna Environmental Center at Stone Farm. NW view. 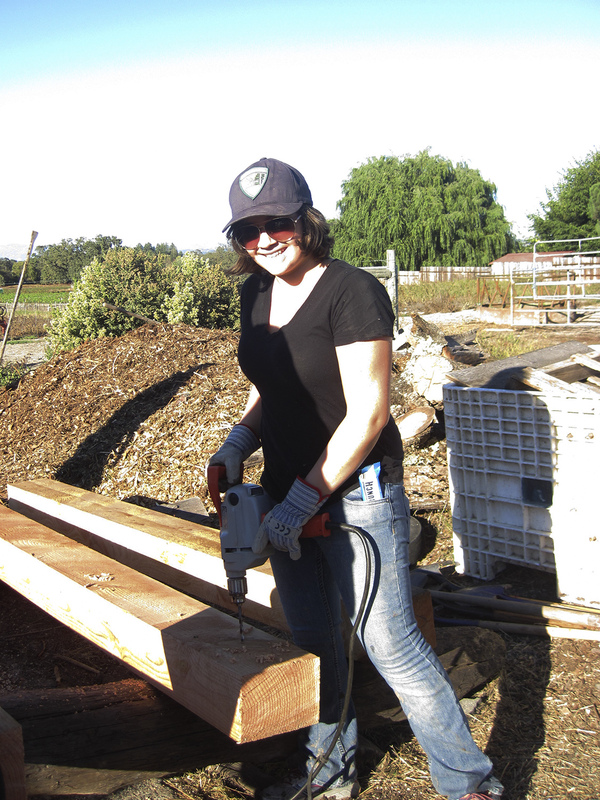 Student-carried oak logs await insertion into Compost Cricket Corral. Class is over; Tony stays on to finish the habitat installation. 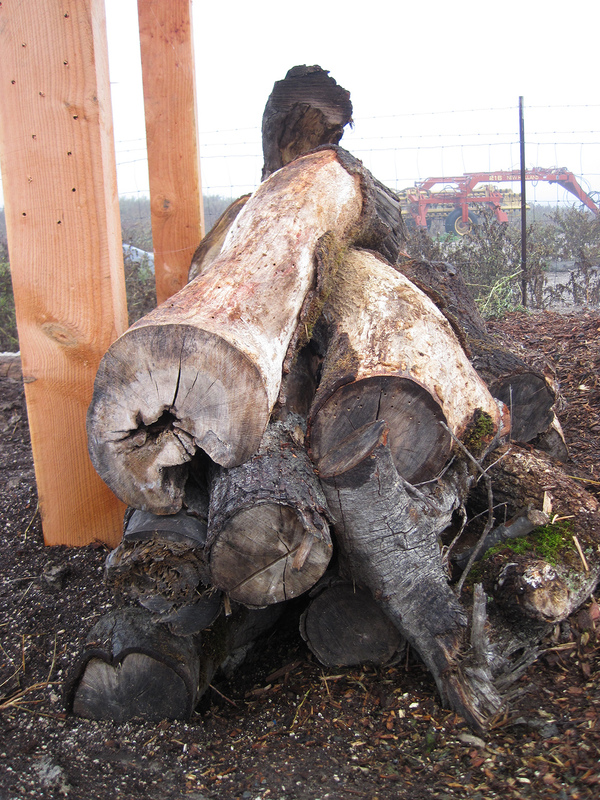 Students gathered these oak logs from the farm to be used in the habitat installation. 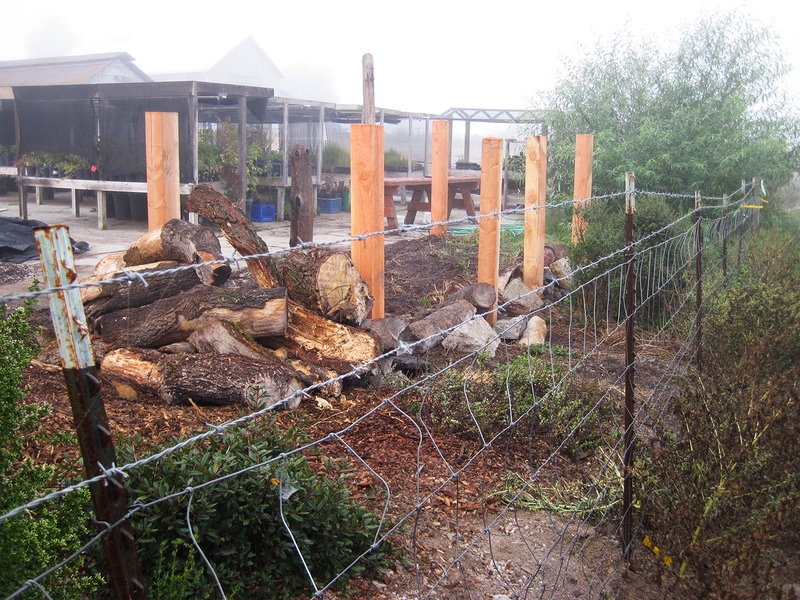 The logs are used to edge the back of the compost corrals and to create a wood pile next to one end bin. 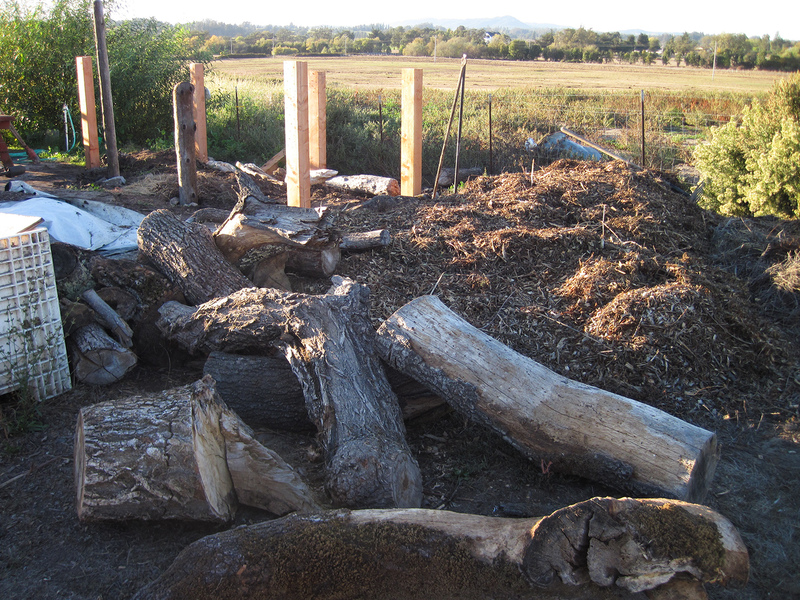 That log pile will house gastropods (snails and slugs), insects, other crawly critters, lizards, snakes, and other animals. 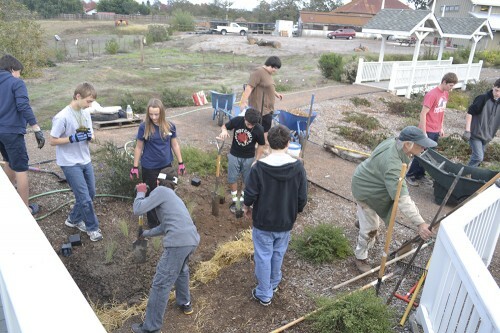 The purpose of this habitat installation is to maximize the compost area – the animals sheltering nearby will visit the compost and add to its richness. 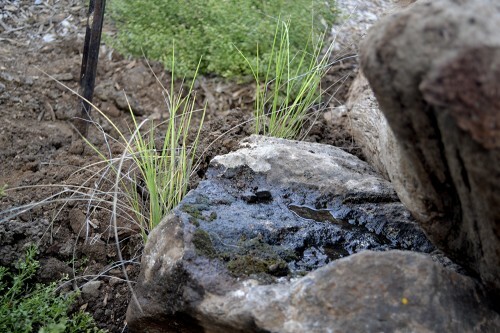 Rich biodiversity at the compost will create better soil, faster. W view. 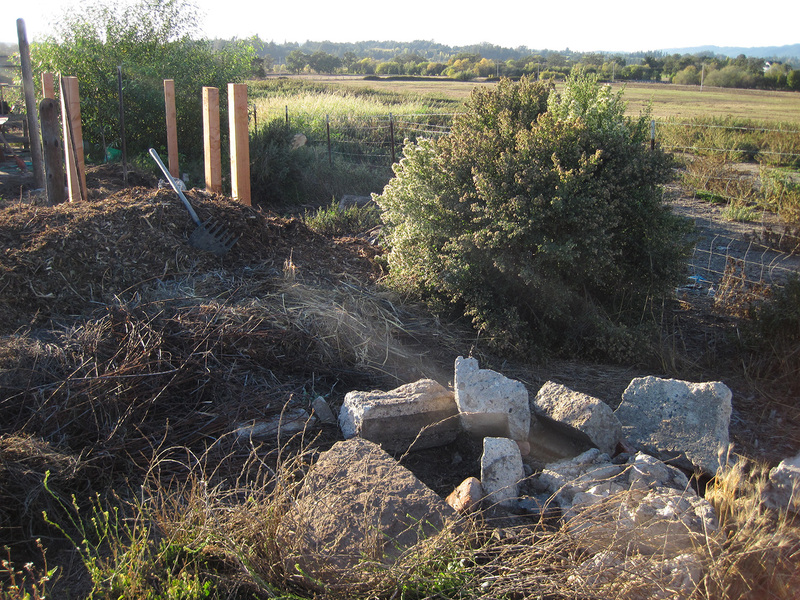 Half of this refuse concrete blocks pile was used to support Compost Cricket Corral’s posts. The blocks were snuggled up against all sides of each post, in the gaps of the posthole. No new concrete was poured/made for this installation. 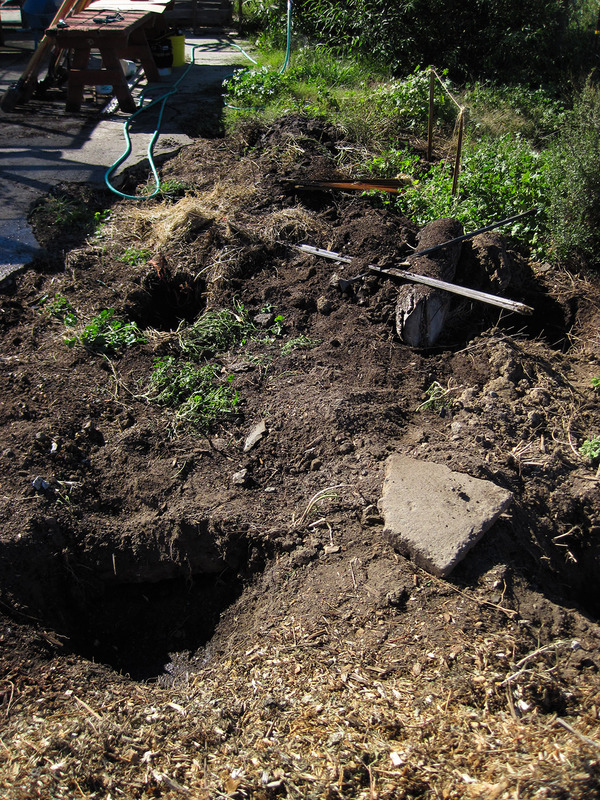 Stacking functions (Permaculture) – let’s clean this place up, raise the level of the compost, AND create habitat. 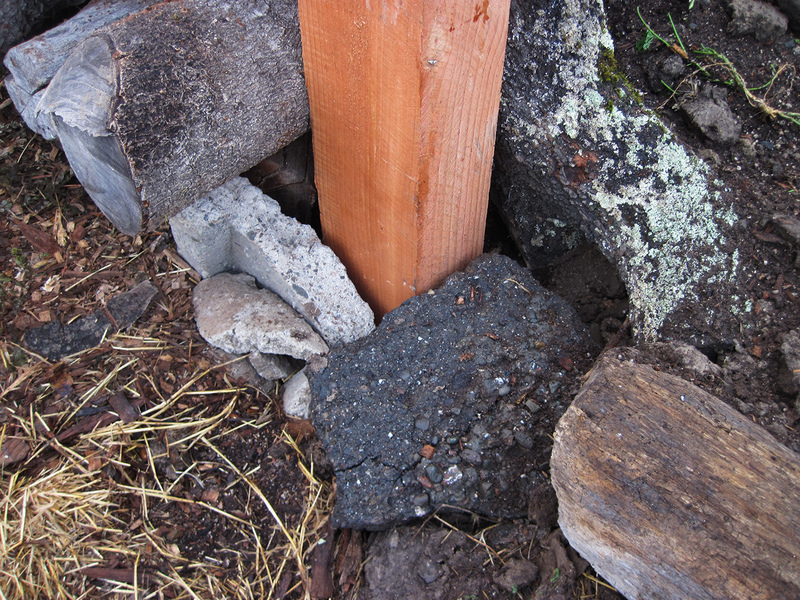 Old concrete chunks are used to bolster the back edge of the compost. 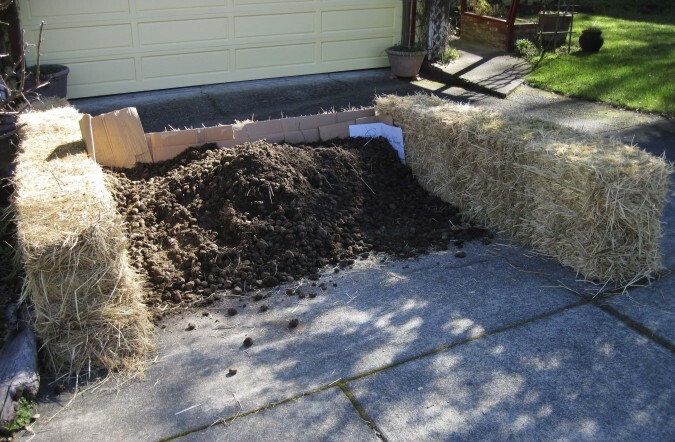 A raised floor to the compost pile will help it drain better, preventing an anaerobic condition (no oxygen to support decomposition) in the rainy winter months. 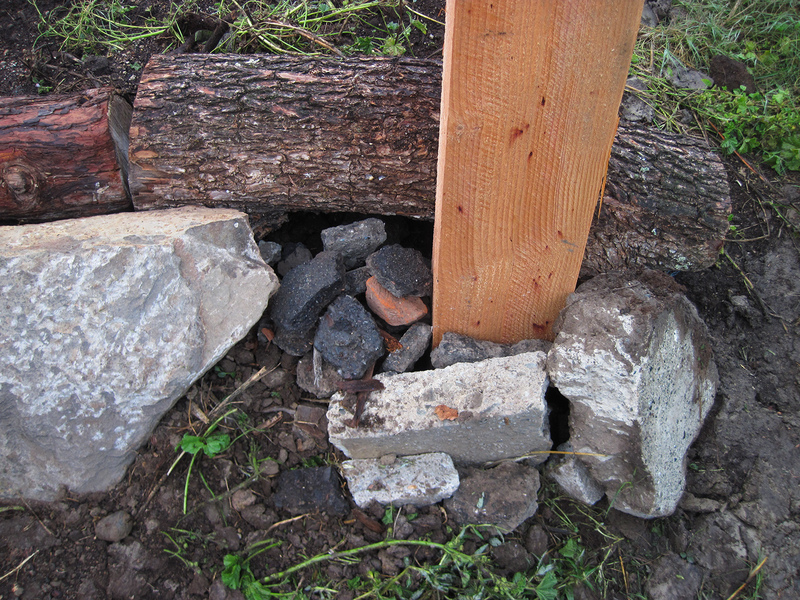 Besides holding logs in place, the concrete chunks also create cavities for critters. The sun is setting on this project. 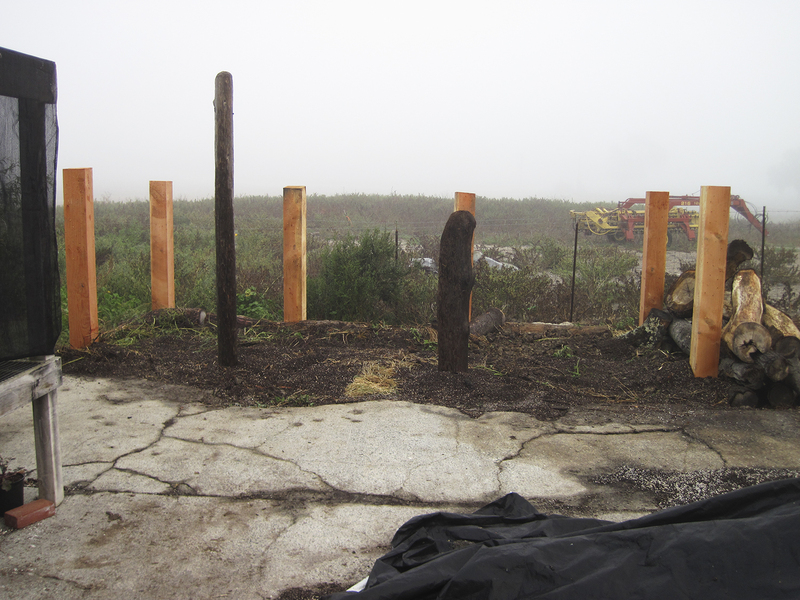 Posts are in, the soil base is leveled, and the log pile has been started (far end). Time to call it a night. I finalized the project under a rising full moon. Excited to see the finished result in the morning! NE view. 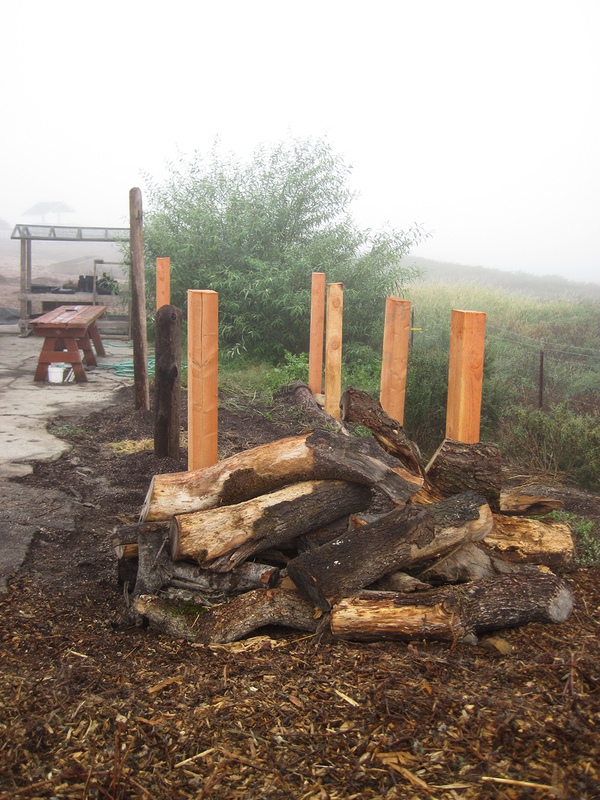 Compost Cricket Corral (CCC) was completed last night and given a good sprinkle of water before being to put sleep by the chill night, enjoying its warm Northern California October night, till the warm fog rolled in this morning. E view. The next morning. Finished and looking good! Ready to make compost and invite the growing neighborhood of critters. N view. 3 compost pile bins, each roughly 6 feet X 6 feet. NW view. Note the sawdust from drilling insect holes on the tarp in the foreground. NE view. The log pile, Log Pile Apartments, will house many critters. West view. 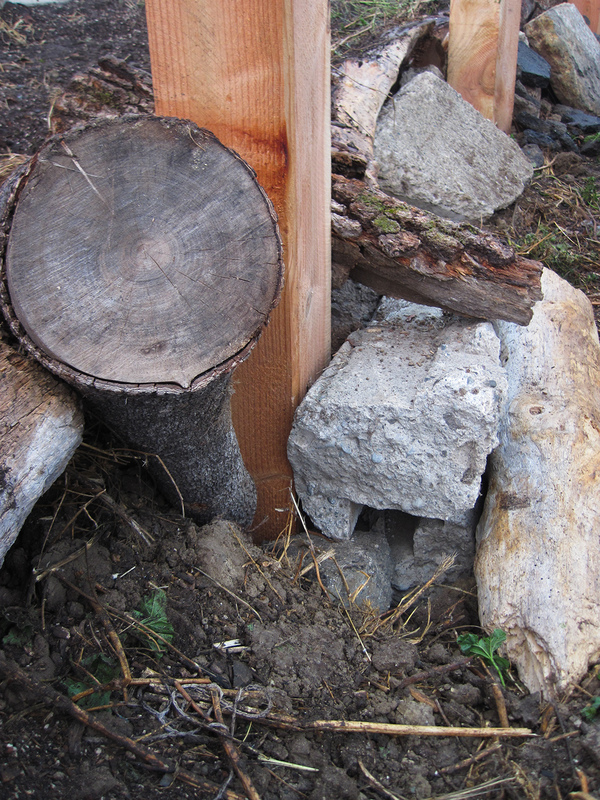 Critters will travel between the compost, log pile, wood chip pile, and surrounding fenceline. Vacancy at Log Pile Apartments. 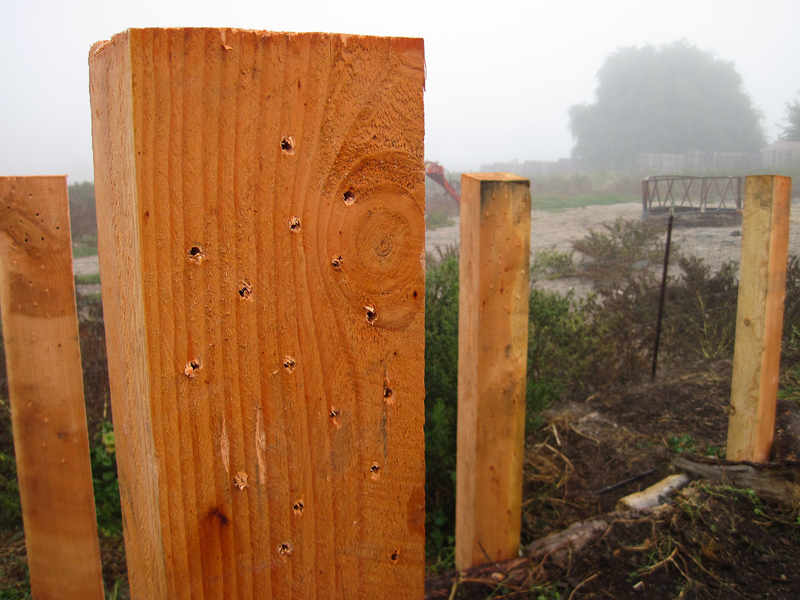 5/16” holes drilled into posts to encourage insects to live in the wood. 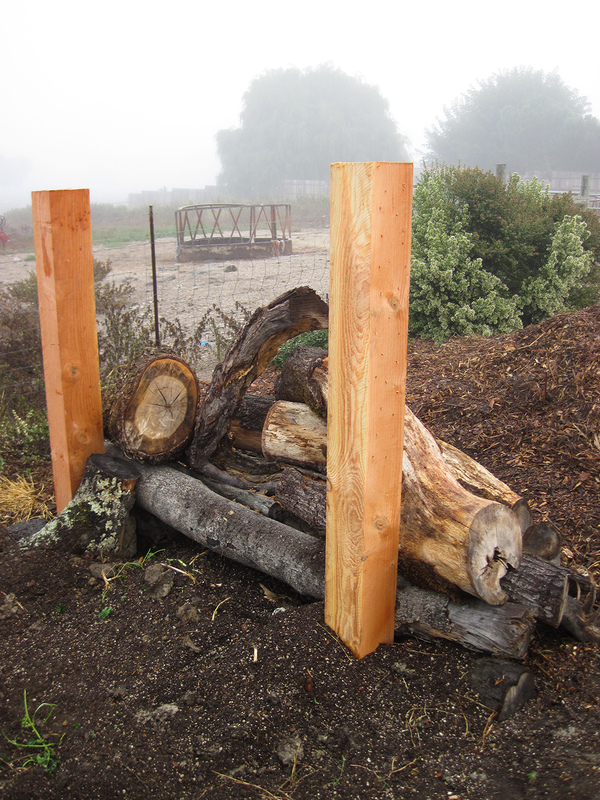 These fir posts will invite insects and fungi to thrive in Compost Cricket Corral. Fir wood (#3 rough) was specifically chosen because of its vulnerability to Nature. Close-up of post insect holes. Nice job, again, Sunny and the Biology students (Uly, Tristan, Nick, Moses, Matt, Lily, Leo, Lauren, Kaleb, Jenna, Hannah, Cordy, Coco, Brendan), and Dave. Everyone, enjoy your wildlife habitat creations! Play outdoors! During each calendar month, Spore Lore will accept postings of residential wildlife habitats to Spore Lore’s facebook page, Habitat It and They Will Come. Click to post your Habitat of the Month entry. 1) The name of the garden habitat. 3) At least one picture of the the wildlife habitat. All Habitat of the Month Contest entries will receive a “Habitat It!” bumper sticker. Habitat of the Month, as in the The Winner, will receive a signed copy of Tony McGuigan’s book, Habitat It and They Will Come. The month’s winning habitat will be chosen from a review of Comments (facebook) posted to the entry AND ALSO from Tony’s impression of the contest entry. In the case of a tie, two (2) winners, both declared “Habitat of the Month” will be announced. Contest entries (postings to the facebook page Habitat It and They Will Come) will be accepted till noon (Pacific treefrog time) of the 28th day of the month (26th day for February). Contest winners will be announced by 6PM (Pacific treefrog time) on the 30th day of the same month (28th for February). Contest winners will be announced primarily at Spore Lore’s website (sporelore.com\Blog\Habitat of the Month Contest) and at Spore Lore’s facebook page (Habitat It and They Will Come). To receive your contest entry “Spore Lore” sticker, and/or receive a book if your habitat is chosen as Habitat of the Month, please email your postal address to habitatofthemonth@sporelore.com; please include the name of your habitat in your email. Please enter your garden habitat one time only. However, if significant changes have been made to the habitat and/or significant documentation (like pictures!) of the habitat is available, then the same habitat may be re-submitted as a new contest entry. 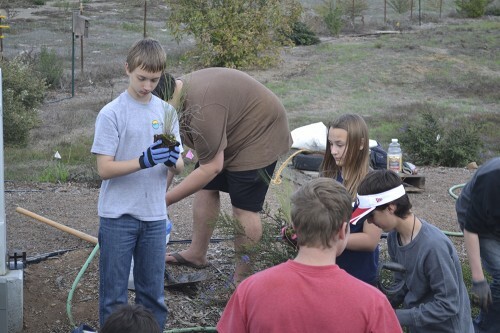 Create wildlife habitat and have fun. Post your habitat to Habitat of the Month. There is no cash value for any contest rewards or contest prizes. Participants/Entrants of the Contest give Spore Lore permission to leave contest posts on Spore Lore’s facebook page, https://www.facebook.com/HabitatItAndTheyWillCome, and to post Contest entries and Contest winner announcements to Spore Lore’s facebook pages (Habitat It and They Will Come, Spore Lore, and Tony McGuigan), as well as Tony McGuigan’s/Spore Lore’s other social media sites (Twitter, Instagram, Pinterest, YouTube) and Spore Lore’s website (sporelore.com). Spore Lore reserves the right to use the winner’s name (if provided in the contest entry), habitat name and habitat location (if provided in the contest entry), for publicity purposes only in connection with the Contest and for no other reason. Spore Lore is not bound to announce contest entries/winner/winners. GOVERNING LAW: Contest governed by the laws of California and subject to all applicable federal, state and local laws and regulations. Accordingly, all issues and questions concerning the construction, validity, interpretation and enforceability of these Official Rules, or the rights and obligations of the Contestant and Sponsor in connection with the Contest, shall be governed by, and construed in accordance with, the laws of the State of California, without giving effect to any choice of law or conflict of law rules (whether of the State of California or any other jurisdiction). The Contest is void where prohibited by any applicable law. Contestants, by participating in this Contest, hereby waive and release, and agree to hold harmless Spore Lore and all of its respective officers, directors, employees and representatives and agents, from and against, any and all rights, claims and causes of action whatsoever that they may have, or which may arise, against any of them for any liability for any matter, cause or thing whatsoever, including but not limited to any injury, loss, damage, whether direct, compensatory, incidental or consequential, to person, including death, and /or property, arising in whole or in part, directly or indirectly, from their acceptance, possession, use or misuse of any prize, or their participation in this Contest, or any prize-related activity. By participating in this Contest, Contestants agree to be bound by these Official Rules and the decisions of Sponsor. Except where prohibited by law, by accepting a prize, winner agrees that Spore may use the winner’s name, address (state), photograph, likeness, and/or prize information for advertising, publicity and promotional purposes and to the use of statements made by or attributed to winner relating to Spore Lore or to this Contest and grants to Spore Lore any and all rights to said use without further notice and/or compensation except where prohibited by law. It’s now Friday, so my back and body in general are nearly recovered. On Monday this week, I spent the whole day shovelling manure and compost on top of Food Ridge West, our raised veggie bed and animal habitat. Veggie bed — because the debris pile covered with manure/compost/gardening soil will be plantable this late spring. 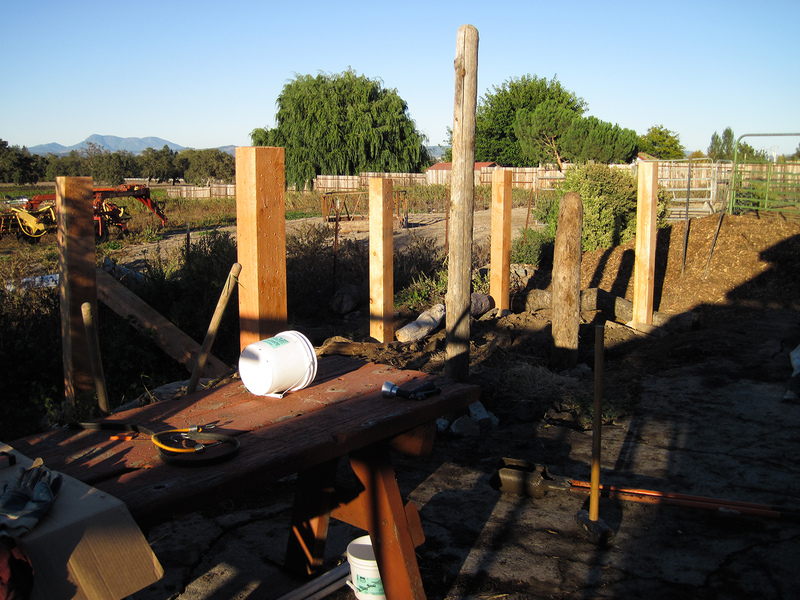 Below are three videos of this week’s progress with the hugelkultur Food Ridge West. Enjoy! Food Ridge West Hugelkulture now has a layer of pine tree limbs in the center of the better, more growth-supportive wood debris pile. Horse manure will be used to “burn” the pine and help it become a good veggie bed resource faster. Eleven yards of manure/compost are now on the hugelkultur. 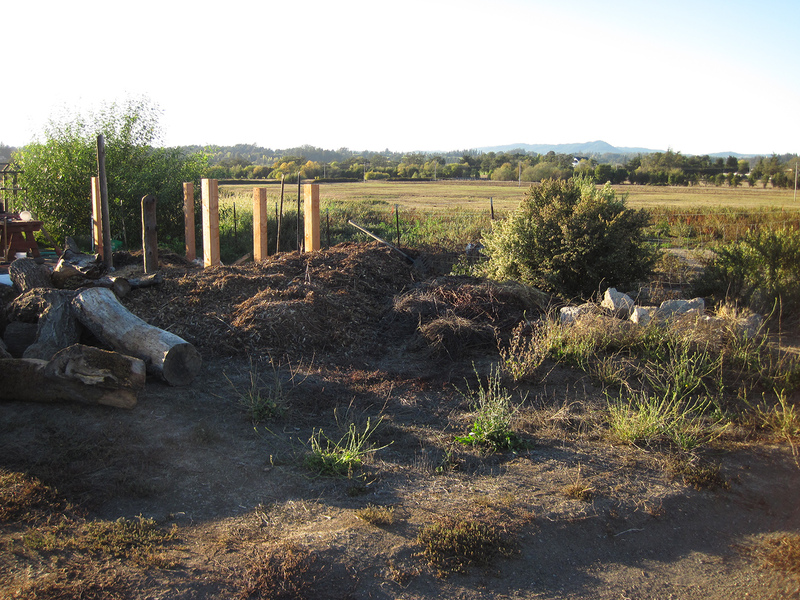 The compost corral is empty, almost — the rest will go to another site. Now, we are ready to give the hugelkultur a new hairdo. Cousin It has been hangin’ out at the hugelkultur! 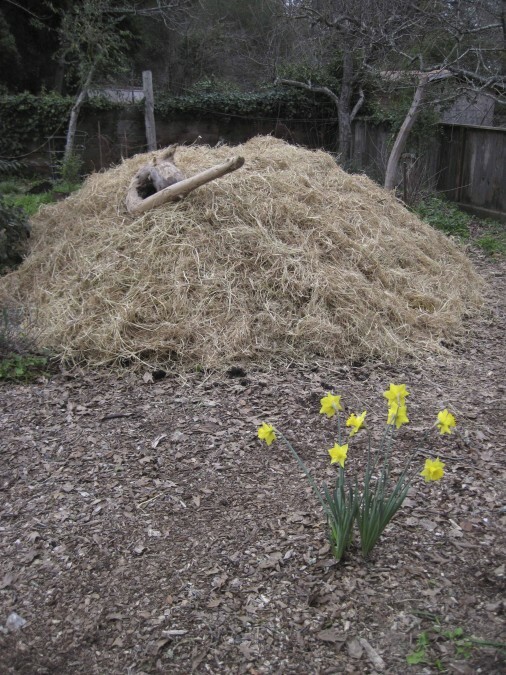 The compost/manure pile is on the hugelkultur! A bale of rice straw has been scattered over the compost to avoid erosion from the coming rains. Food Ridge West before final layer of garden mix. The shredded rice straw bale is used to reduce the soil’s erosion from the coming rains. The final layer, of organic garden mix, will be added in a couple of weeks and by then the compost/manure under-layer will have settled some. Happy habitat creations and don’t forget to sniff the daffy’s. 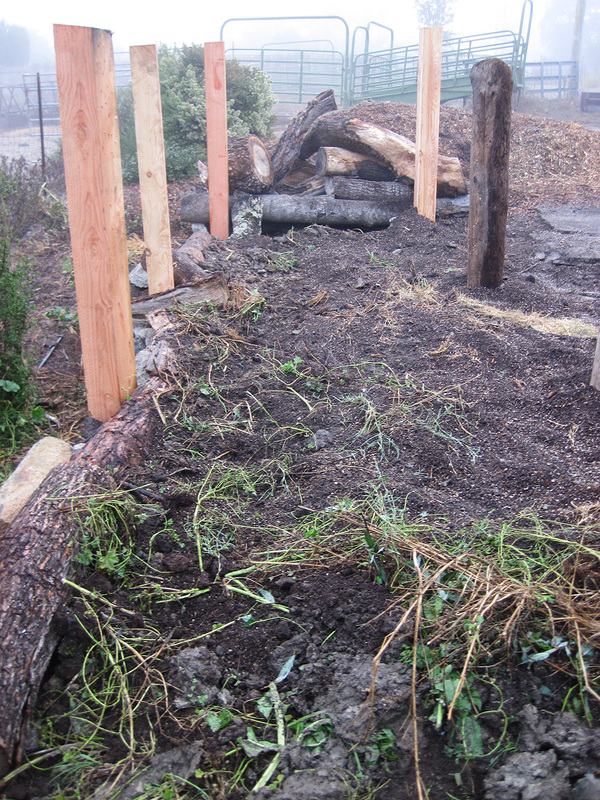 Yesterday, Valentine’s Day ♥, was the start of new layers to our animal habitat/veggie bed hugelkultur, Food Ridge West. 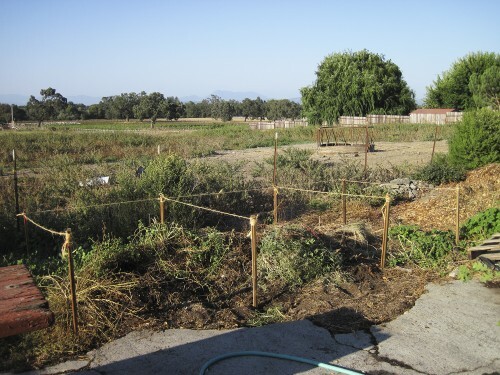 The new layers are pine tree prunings, horse manure, and organic vineyard compost and can be seen in my post Happy Valentines Day AND Garden What You Love. A straw bale holding bin was constructed on our driveway to stockpile soil-making material till moving them to the hugelkultur. 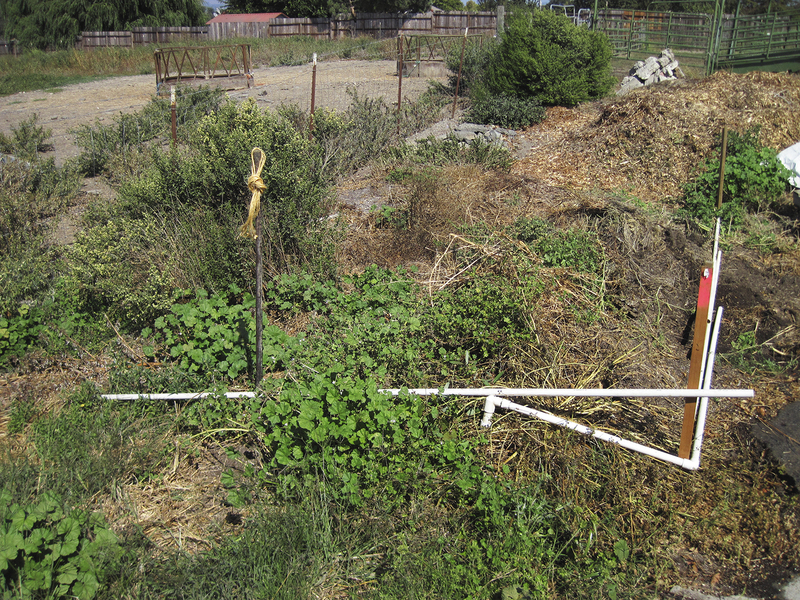 Also, the rectangle box, or “corral”, would be a good place for the compost company to dump the ordered organic vineyard compost. 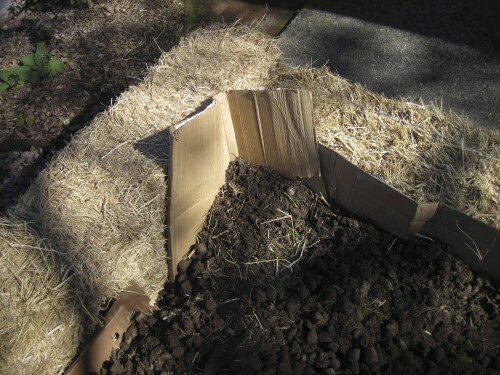 Soil corral reinforced with cardboard corner. The cardboard gives structure to the straw housing and prevents leakage between the bales. 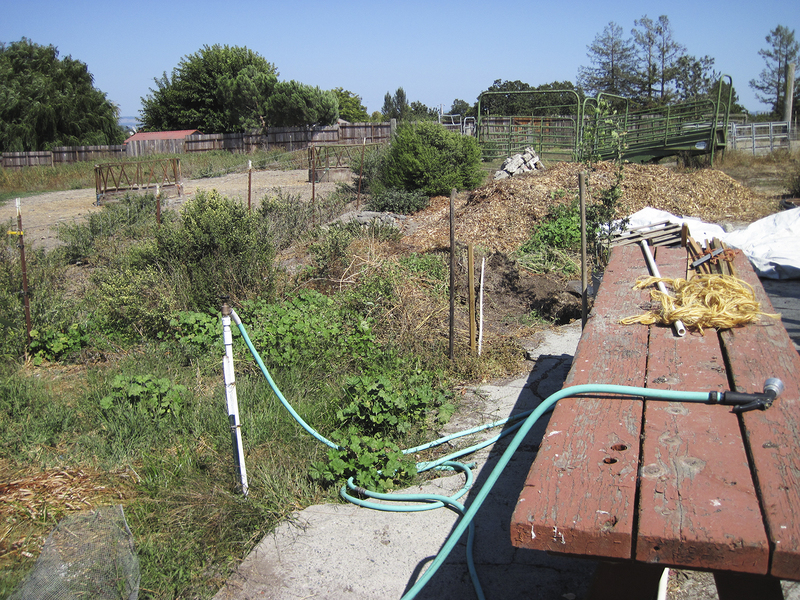 The rough concrete driveway is lined with a cardboard floor and folded up the sides of the bales. Easier cleanup of the concrete and less leakage of the corral’s contents. The manure and compost impregnated cardboard will be composted, perhaps thrown in the bottom of another hugelkultur after we clean up this project. A couple of pickup truck bed loads of manure were used to line the bottom of the corral so that the vineyard compost could be dumped on top. Shoveling out the pile into wheelbarrow loads then mixed the two soil additives to be dumped onto the hugelkultur. 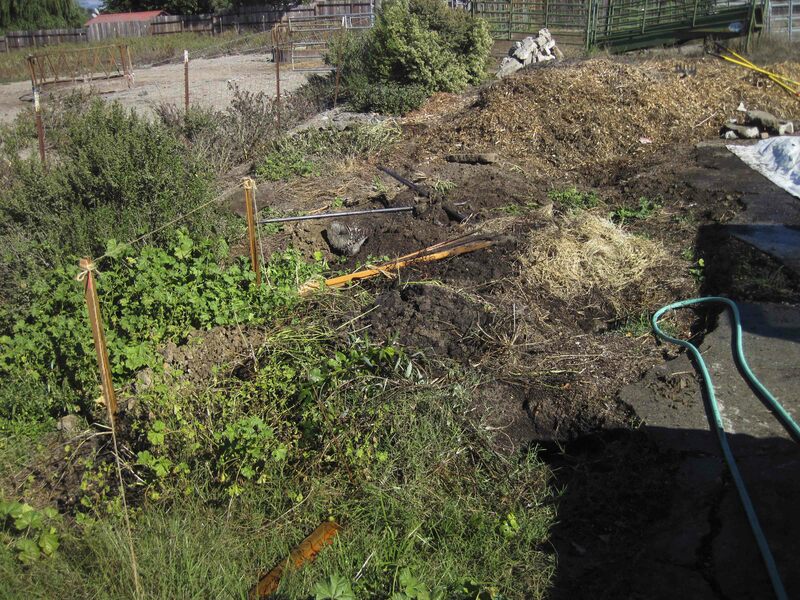 Early stage of manure and compost bin. The bin was expanded with more bales, and a second tier of bales was added, to fit the incoming vineyard compost mix. And here comes the dump truck! Have a happy hugelkultur habitat day! Today is my fourth posting of rebuilding hugelkultur Food Ridge West. Go to Hugelkultur to see a description of this European garden art. Today’s video shows the final stages of building the base of the hugelkultur. Its “keyhole garden” shape is discussed. Heavy limbs weighing down the lighter sticks on Food Ridge West. This woody mesh of twigs, sticks, and limbs makes a good base for organic debris layers to come. Note all the nooks and crannies that will be available to garden critters. HABITAT!!! Entrance to the keyhole garden hugelkultur, Food Ridge West. Close-up view of entrance to the keyhole garden hugelkultur, Food Ridge West. 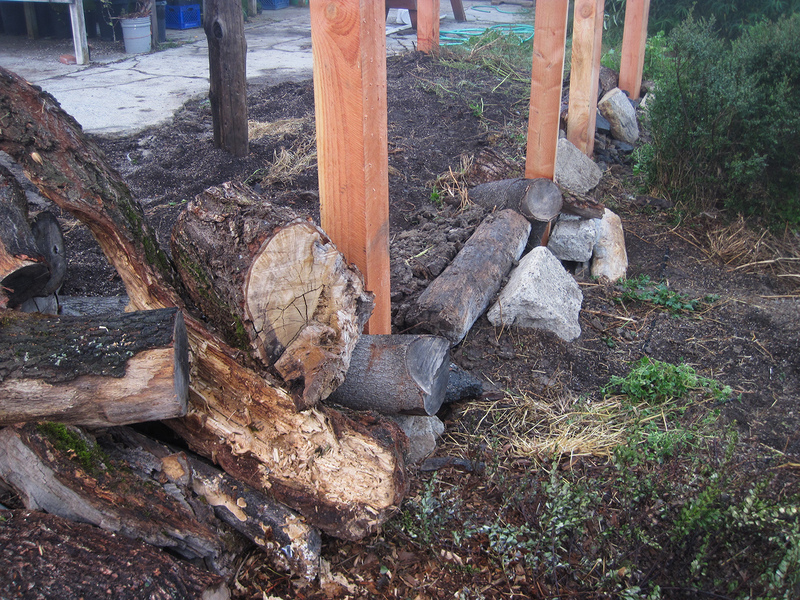 The added layers of organic debris will rise over the vertical log (left, inside the keyhole garden bed), only to settle back down again next year. Each year’s added layers mean better soil for crops. Happy hugelkultur habitat making. See you tomorrow. 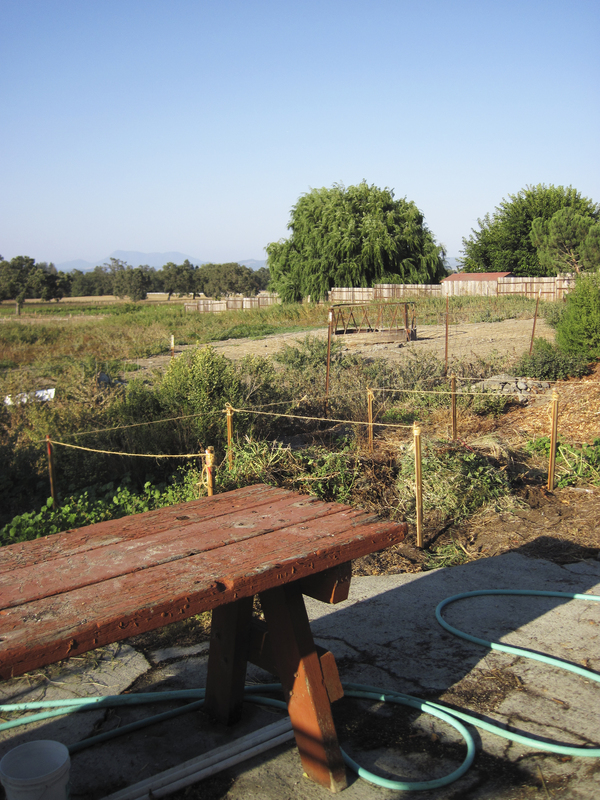 Today is my third posting of rebuilding hugelkultur Food Ridge West. Today’s video shows working lighter sticks first, then heavier sticks on top. Hugelkultur Building 101! Adding lighter twigs, then heavier sticks and limbs to the hugelkultur. 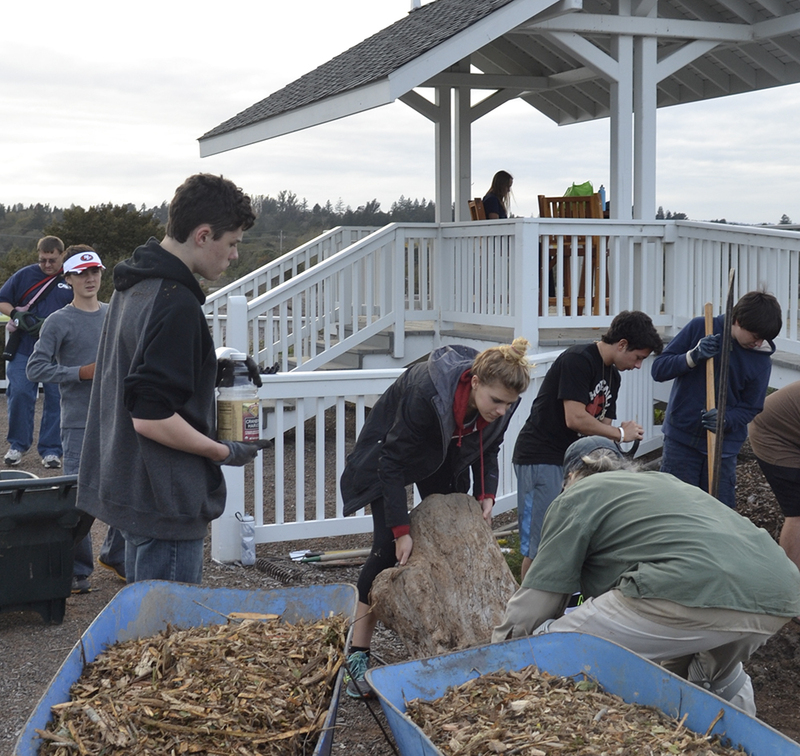 The heavier limbs will help compress the organic debris pile.